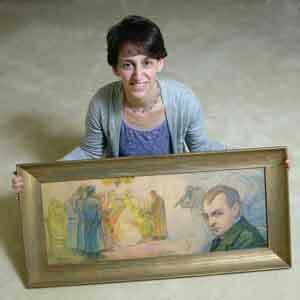 Elizabeth Rynecki with one of her great-grandfather’s paintings; all images courtesy of Elizabeth Rynecki. It has been nearly 75 years since Polish painter Moshe Rynecki perished in a Nazi concentration camp, but for his great-granddaughter, Elizabeth Rynecki, his works bring life to a cherished lost world. Moshe Rynecki, who lived in Warsaw in the early-20th century, produced more than 800 pieces of art, mainly of the diverse Jewish community in Poland, one of the largest prewar Jewish communities in Europe. He was murdered by the Nazis, and his art was scattered throughout the world. His great-granddaughter, who still lives in Oakland, has dedicated her life to learning the fate of his lost works. Moshe Rynecki’s Curious Children, for example, shows a group of kids peeking through a window. In Readers, an illustration rendered in India ink, an elderly man reads a siddur by candlelight. Forced Labor, created while Rynecki was restricted to the Warsaw Ghetto, shows Jews pounding stones. Toy Factory, a watercolor, shows a couple engrossed in creating brightly colored playthings. Born in 1881 to an impoverished Hasidic family, Moshe Rynecki came of age on the outskirts of Warsaw, near the town of Siedlce. His father, Abraham, was a tailor. Abraham and his wife, Frieda Rachel, had 18 children, but only five—Moshe, Itzchak, Jakov, Chaya and Jospah—survived childhood. According to family lore, as a small boy Moshe loved to draw and covered the walls of his family home with chalk drawings. He attended yeshiva, then went to a Russian middle school. In his midtwenties, he enrolled in the Warsaw Academy of Art. He married Perla (also known as Pearl or Paula) Mittelsbach of Warsaw, and the couple had two children, Bronislawa, a daughter, and George, Elizabeth’s grandfather. 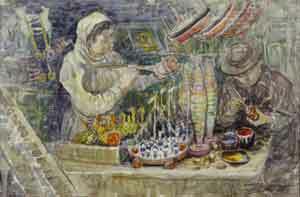 Moshe Rynecki painted while his wife managed a small art supply store. It was uncommon for an Orthodox Jew to enter the secular art world, said Barbara Kirshenblatt-Gimblett, program director for the core exhibition of the Museum of the History of Polish Jews in Warsaw, but Rynecki showed a rare talent in childhood. 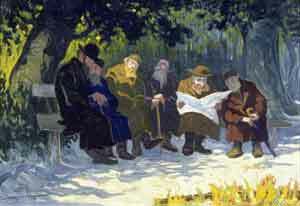 Rynecki made his name depicting both daily and religious life. With bold brushstrokes and rich pigment, he showed men reading the newspaper as well as a Torah procession. He painted women sewing and men carrying a bucket of water. His was a world of movement and quiet contemplation. Then, in 1939, Germany invaded Poland. Concerned about his life’s work, Rynecki packed up his paintings into several bundles and sent them to nonJewish friends. Then he gave his children a list of the paintings’ locations. “He hoped that even if he should die, his art might live,” Elizabeth Rynecki said. In 1943, Moshe Rynecki was sent to the ghetto and, later, to the Majdanek concentration camp, near Lub-lin, where he died. His wife; George; George’s wife, Stella; and their son, Alex (Elizabeth’s father), went into hiding together and survived; Bronislawa was murdered in the ghetto. After the war, George and his mother found two bundles of art in a town outside Warsaw. They brought the paintings to the United States when they immigrated. It was her grandfather George’s death in 1992 that brought Rynecki to appreciate her family’s legacy. While going through his personal effects, the family discovered his memoir hidden in the trunk of his car. Reading the memoir, which was later published as Surviving Hitler In Poland: One Jew’s Story (Trafford), changed the way Rynecki and her father spoke about the Holocaust. “We cannot and will not forget,” her grandfather wrote of the Holocaust. “We will carry it, like the Bible, forever. There are hundreds of books on the subject. With her grandfather’s words urging her on, Rynecki vowed to locate the remaining paintings. She became the family archivist, curator and publicist and launched a website, rynecki.org, chronicling her great-grandfather’s life and creating a virtual museum of his art. Word spread. People called from around the world; some told her that they had a painting or two, others gave her information about works hanging in institutions. At the start of her research into her great-grandfather, Rynecki had decided not to make a legal claim on any of his art. She would focus on finding and documenting the pieces. “I would love to know the stories behind the paintings, how people got them and what they [depict],” she explained. Her decision to act as his-torian rather than claimant has yielded results. In 2013 alone, she learned of 39 previously unknown paintings. One of Rynecki’s biggest triumphs came in October 2013. She was in Canada on a speaking engagement for a program at the University of Toronto’s Centre for Jewish Studies. At the event, Barry Dov Walfish, the university’s Judaica expert, told Rynecki about a trove of photographs, newspaper articles and handwritten letters from Moshe Rynecki in the university’s Schneid archive. She examined the collection—and was thrilled to find 13 black-and-white photos of paintings she had not previously known existed. Even more poignant were several letters written by her great-grandfather. In June of that year, Rynecki received photographs of seven paintings owned by a woman in Israel; the paintings were originally bought by relatives who were partisan fighters during World War II. Additionally, after months of correspondence with the Jewish Historical Institute in Warsaw, Rynecki received photographs of 17 of the 52 Moshe Rynecki paintings in their collection. Recently, the project won several contests from Indiewire, a news and information website for independent filmmakers, including Project of the Day and Project of the Week. Rynecki has also signed an agreement with Martin Literary Management for a book based on her story. Cathryn J. Prince is a freelance journalist and writer; her most recent book is Death in the Baltic: The World War II Sinking of the Wilhelm Gustloff (Palgrave Macmillan). Hey, thanks for this wonderful article! Just so you know I think it is “they’re” instead of “there”.